WooCommerce coupons are good. But these new WooCommerce extended coupon features takes it to a whole new level. 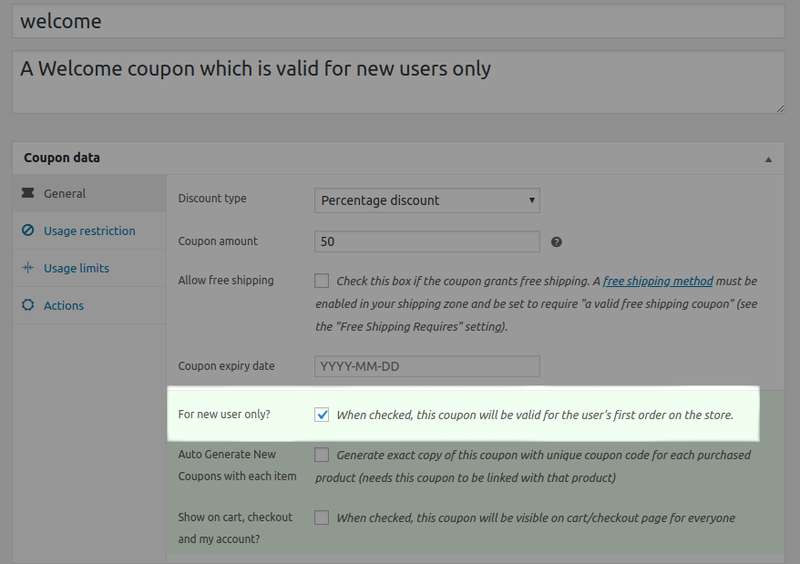 All thanks to Smart Coupons, the most popular WooCommerce coupons extension that has added five new coupon features in its kitty. Btw…you can use these features only if you have Smart Coupons enabled on your WooCommerce store. Let’s quickly check the new features and their usefulness. Smart Coupons gives you pre-defined styles & effects which you can use to display coupons on your store. Some like plain, some like borders. Some even like the overlay type. What’s your pick among these six? Moreover, you can choose different background colors, text & border to match your store’s color scheme. You want more new customers to your store but you feel many of them won’t convert without a bait. So this feature is super useful in offering a welcome discount or special offer for new users. You can set a coupon which can be used only once & only for those customers who have never purchased anything from your store. A very helpful feature to sell more, increase ARPU (Average Revenue Per User) and delight customers. Using this feature, you can offer a free product or other valuable products along with the main product by linking the product with the coupon. Clicking on the coupon will automatically add up the product to the cart. Actually, gifting a product can get you more money. Don’t believe me? Here are the 7 easy hacks!! This is an already existing feature with a twist. Earlier when users wanted to give some money to users, they could send it in the name of either “Store Credit” OR “Gift Certificate”. Users wanted a provision to issue or gift that money in the name of “Gift Vouchers”, “Gift Cards”, etc. So using this feature, you can easily label the existing “Store Credit” to whatever name you wish to which better suits your store and help your customer better relate with that credit. As seen in the above image, you need to set both singular (Gift Card) and plural (Gift Cards) names for the labels. For auto-generated coupons, the coupon code was lengthy. Users wanted something simple and short. This feature will allow you to define the number of characters for the auto-generated coupons. I hope you liked these new WooCommerce extended coupon features. It’s the holiday season. So use these features to their full advantage. Feel free to share your feedback on these additions.